Tapscan, Inc. is the common denominator among the team of experienced radio software professionals of Cornerstone Research. 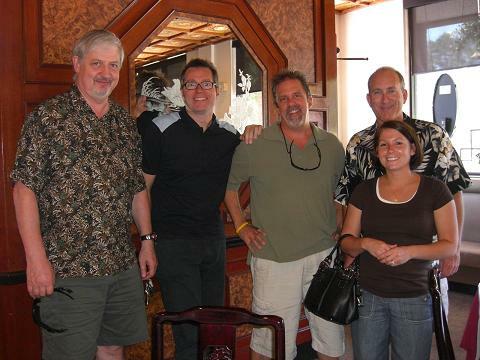 Brad Riegel, Mark Schreiber, Dale Radtke, and Angie Owens all worked with each other at Tapscan, accumulating over fifty years of combined experience at the Birmingham-based software company. Geno Pearson joins all of the ex-Tapscan staff adding further depth to our radio heritage with his wealth of radio programming and music industry experience. Brad Riegel is one of the industry's leading experts on understanding, interpreting and presenting Arbitron data. From nearly its inception, Brad was the lead developer for the Tapscan product. As one of Tapscan's original hires and its VP/Product Development for fifteen years, Brad has been crunching Arbitron data for a long time. But Brad's not a "wirehead," he's a regular guy who loves and knows radio. As a former radio programmer, researcher and air personality, Brad brings a broad perspective to all the projects he oversees for Cornerstone Research. Mark Schreiber also developed his chops at Tapscan, where he mostly spent his eleven years as GM of the MusicScan division (MusicScan was the music scheduling program now known as MusicMaster). Between his Tapscan and Cornerstone experience, Mark has been providing software to radio programmers for over twenty years, which makes him feel very old. Mark's background is in radio programming. His last gig was with (then) KOB-AM/FM/Albuquerque, where in the mid-80's he helped the stations achieve a 29.3 combo share (12+). If you want to endear yourself to him, bring up the Dodgers! Dale Radtke enjoyed five successful years at Tapscan/Arbitron working primarily on TapMedia, the web-based delivery and production system for customer downloads. Prior to joining Cornerstone Research Dale had an extensive background developing web-based and desktop software applications and worked for Microsoft in the Seattle area before relocating to Alabama. Prior to that he served in the U.S. Army for 20 years, as a pilot and intelligence officer. Geno has been working in radio for over 20 years. His career started in Houston as Music Director for KHMX where he worked under PD Guy Zapoleon. After 7 years in Houston between KHMX and KTBZ Geno moved on to MD at KNRX, Oklahoma City, APD at WKSI, Greensboro, NC and most recently Program Director at WRRS, Birmingham. He also participated in the Active Industry Research (AIR) competition for Fall 2001 and placed 2nd out of 100 PD’s and MD’s from across the country at predicting the chart success of new records that come out each week. An expert in (and fan of) music of all genres, Geno also programs five channels for Webcaster GotRadio.com. Geno, his wife Michele, their son Rhett, and their dog Ruby live in Birmingham. Angie joined Cornerstone as another Tapscan/Arbitron alumni. During her tenure there Angie worked extensively with many forms of quantitative and qualitative data as well as managing development of data processing systems. She also worked with numerous software products developing requirements, performing quality assurance and overseeing their deployment. Most recently Angie worked for the ad agency Intermark in their Interactive division. Angie and her husband Jonathan live in Birmingham with their two sons and daughter.